Turmeric, also known as Curcuma Longa is a relative of ginger that contains a powerful antioxidant (Curcumin) that has been closely studied over the years due to its effectiveness in treating anti-inflammatory diseases. Turmeric is said to be an excellent ingredient to combat inflammation that can range from digestive problems to conditions that are associated with the degeneration of cartilage in the body – like Osteoarthritis. Turmeric also works to purify the blood of toxins and has been proven to reverse the effects of high cholesterol. It also contributes to maintaining healthy levels of cholesterol. 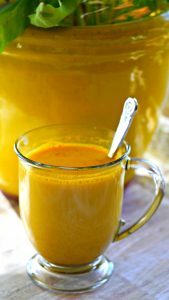 The anti-inflammatory properties of turmeric coat the throat, lungs, stomach and intestines. This works to decrease congestion and inflammation in the digestive tract. People who suffer from IBS, Colitis, recurring diarrhea and upset stomachs, Crohn’s disease and even those getting over bouts of extreme food such as Salmonella, turn to turmeric to heal. Turmeric is recommended for chronic digestive weakness and congestion. It can be taken in the form of digestive bitters or it can be spooned into meals that are high in protein or fat to combat gas and bloating. It’s also a key agent in fighting several cancers including cancers that affect the colon, pancreas, prostate, skin, esophagus, lung etc. Finally, at the level of the skin, it works to reduce itching and inflammation associated with eczema, psoriasis, acne and the like – due to its potent detoxifying agents. The medicinal properties of turmeric are boundless and we’ve only scratched the surface of its potential. However, it is important to note that turmeric needs to be made bioavailable to our bodies in order for us to reap its rewards. Bioavailability is concerned with the principle property of drugs – it measures how much of the compound actually reaches our system in its raw and pure form, unchanged. Curcumin is degraded and broken-down once it enters our blood and plasma, and its full effects are unfortunately stripped away. This is why we have to consciously activate turmeric’s bioavailability when we consume it. How do we increase its bioavailability? Black pepper – as the alkaloid compound Piperine found in black pepper enhances its bioavailability. Healthy Fats – Turmeric has low solubility in water so it becomes more bioavailable when consumed with olive oil, coconut oil, fish, and any other healthy sources of fat. Through Making Tea – Heating a fresh root in oil to activate the curcumin properties and boiling it in water to extract it is one of the most effective ways to consume turmeric.